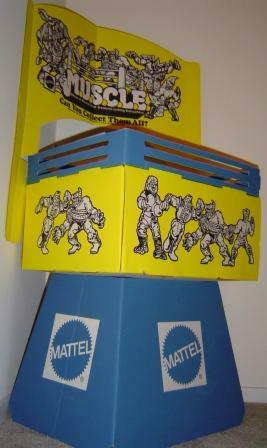 In Mattel’s 1986 catalog there is the most attractive display piece from MUSCLE. 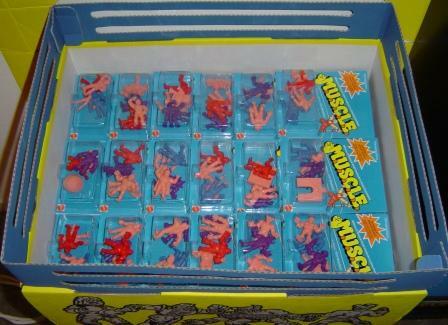 It is called a MUSCLE Pre-Pack. It was designed to hold 144 4-packs inside of a wrestling ring type enclosure. I doubted that I would ever see one, then I actually found a seller that had one. But with such a steep asking price I decided to wait. 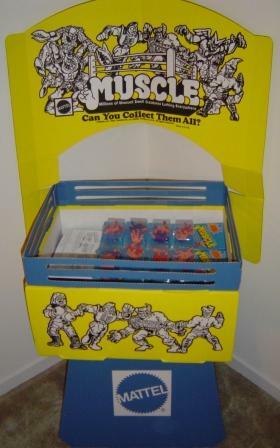 Unfortunately another MUSCLE-head found it too and bought it. Luckily it went to one of the best MUSCLE-heads around, Jason (Doc Moore J) Jason was nice enough to supply me with the pictures. He noted that the piece is very fragile, so it couldn’t be put together 100% accurately. Since Jason couldn’t put the unit together it’s probably best to see how it should have been put together. 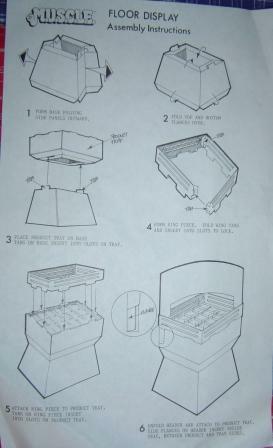 This is a picture of the instructions that came with the display unit. I think it’s safe to say that store clerks weren’t anxious to put this together. Jason was also nice enough to provide some excellent measurements of the display. The display is about four feet tall when completely assembled. The bottom stand is 19” wide, 15” long, and 15” high. The bottom tapers up to the base (which holds the wrestling ring) is 10” wide, 14” long, and 6” high. 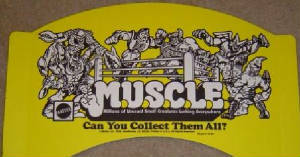 The wrestling ring is 15” wide, 19” long, and 9” high. The ropes surrounding the ring are 3” high. And the arch is 28” wide and 16” high. Unlike the pictures below the arch should actually be displayed diagonally across the ring. As stated before the piece is very fragile, so it couldn’t be put together 100% accurately. 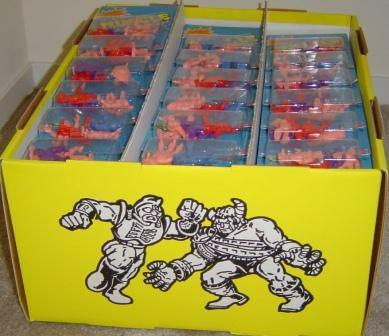 He also noted that there was a great deal of packs that had the exact same figures. Here’s a better close-up of the art on the front of the display piece. However, my eyes are drawn to the art at the top of the arch. I think their choice of figures/characters to highlight is excellent. They chose interesting humanoid figures with only one non-humanoid (“The Hand”). I think it allowed children to easily identify with the toy, but made it fantastic at the same time. I think it’s similar to the majority of original Star Wars creatures from the Cantina or Jabba’s palace. They are interesting, but familiar forms, which makes it more accessible. Here is the front of the wrestling ring part of the display piece. Muscleman, Terri-Bull, and the Screw-Guy are simply copies from the arch. The text, wrestling ring, and other characters have been removed. The figure on the left is the only new image. From this angle we can see the side of the display. Here is a close-up of the side of the wrestling ring. It has been removed from the base of the display and the wrestling ring ropes have been removed. Again, Muscleman and Terri-Bull are simply copies from the arch. The text, wrestling ring, and all other characters have been removed. Although this picture gives us a good idea what a full case of 144 4-packs looks like. Here is an example of what it would have been like to look into a display with figures. 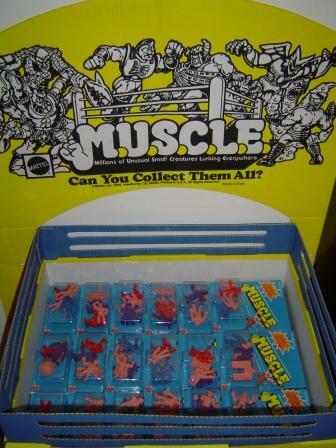 I doubt it was ever this neat after a kid finished looking for their desired figures. 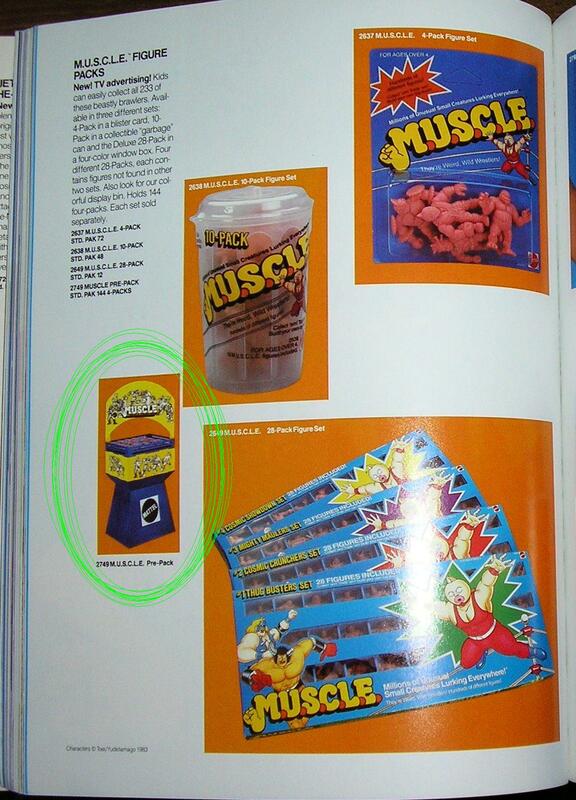 The picture on the left (from the 1986 Mattel catalog) is difficult to see, but there are two things that are crystal clear. The retail arch is different from the arch in the catalog. The graphics on the retail arch are slightly different from the catalog arch. The top of the catalog’s arch meets the side without any plateau. The retail version of the arch has a small plateau on the left and right side. Looking at the graphics you can see that the Mattel logo is further to the left in the catalog and the graphics stretch further down the arch. 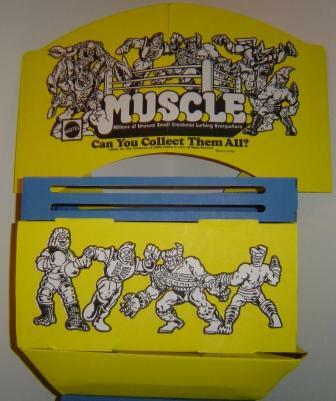 It also appears that the tagline “Can You Collect Them All?” is missing from the catalog version. While I can’t make out the figures perfectly in the catalog it appears that the hand is on the left side (based on the two points sticking out). There is also a figure with dark boots on the left side of the catalog graphics. Looking at the right side of the catalog graphics it appears that there is a “cloud”, plus the coloring looks quite different.